Hyundai India Ltd has launched its new hatchback model- Hyundai i10. 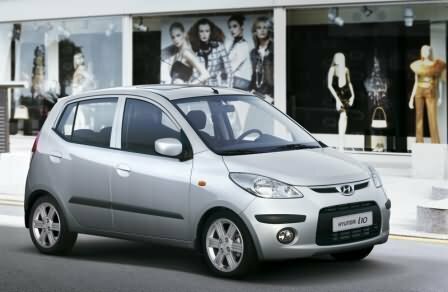 The car is popularly known as Pa. Hyundai i10 is a sleek looking, compact and spacious car. Appearance: The car comes in 10 beautiful colors – Electric Red, Virtual Yellow, Oyster Grey, Stone Black, Crystal White, Deep Ocean Blue, Champagne Gold, Blushing Red, Sleek Silver and Alpine Blue. Hyundai i10 is 5 seater and has 5 doors. The car looks beautiful with black bumper. Fog lamp in the front side, alloy wheels and broad tubeless tyres give a broad and robust look to the car. Comfort: The car has good inner space. It has dashboard integrated centre console. Other comfort features include powerful AC, good upholstery and built in music system. The interiors display luxurious fine fittings to provide unsurpassed comfort and a great feel. Sufficient legroom, knee support and adjustable head rests on all seats adds to style and comfort. Safety: Hyundai i10 as various safety features like front seat belts with pretensioner, impact sensing auto door unlock system, 4 air bags, mounted stop lamp, passenger side cut of switch and Anti lock Braking System (ABS). Other safety features include Seat belt warning lamp, Engine Immobilizer, Clear Lens Fog Lamps, ABS Warning Lamp, Seat Belt Reminder, Child lock and Central locking and Rear Combination Lamps. Engine: The car is available with two different engine options. First variant has 1.1 L, 1086 cc, IRDE engine capable of producing 66.6 PS power and torque of 10.1 k-gm. Other variants have 1.2 L, 1197 cc, kappa engine which produces 80 PS power and 11.4 k-gm torque. Hyundai i10 Asta – Rs.5,17,479. Hyundai i10 Asta AT – Rs.5,78,946. Hyundai i10 Asta w/Sun Roof – Rs.5,33,654. Hyundai i10 D-lite – Rs.3,60,070. Hyundai i10 Era – Rs.3,97,680. Hyundai i10 Magna – Rs.4,25,788. Hyundai i10 Magna 1.1 L – Rs.4,12,876. Hyundai i10 Magna AT – Rs.4,74,332. Hyundai i10 Sportz – Rs.4,54,903. Hyundai i10 Sportz AT – Rs. 5,00, 208. The above specified are indicative prices (taking Mumbai as base price location). The above specified are approximate prices which exclude tax, registration, insurance and cost of accessories.